Pierre Hermé is one of the most influential pastry chefs in modern pastry. He often comes up with “fetishes”, which are unique flavour combinations. The Ispahan is the most popular of these, and includes raspberry, rose, and lychee. This winning trio stars in many of his pastries. Hermé’s book Pastries, in which he actually shares a recipe for his version of an Ispahan croissant, is not very well edited. The book contains many errors and unclear instructions that could easily mislead many bakers (note, however, that some of the newer versions have been corrected). When I read over the instructions for these croissants I was pretty amazed at how sparse they were. Hermé covers making croissant dough in under a page, while I have written a full photo tutorial on the subject! I decided to not use Hermé’s recipe because it calls for uncommon ingredients that are not easily accessible, such as gellan gum (which sets food similarly to gelatin). I used his recipe more for inspiration rather than for instructions. I started off by making a batch of my all-butter croissant dough. I also made some homemade almond paste (which is as simple to make as combining a few ingredients in a food processor). A couple of drops of rose essence imparted the rose flavour to the almond paste. I then rolled out the almond paste between two sheets of parchment paper (Hermé suggests using acetate sheets, which are not a very common tool even in professional bakeries). Next, I cut the almond paste into triangles that I placed on the croissant dough. To make the raspberry-lychee gelée, I knew I had to replace Hermé’s gellan gum. Gellan gum is different from gelatin in that it is not very thermoreversible (this means that the gelée will not easily reverse into a liquid, unlike gelatin, upon heating). Gellan gum is difficult to find, and also using it will result in a perfectly rectangular prism of gelée in the center of your croissant. Um, no thanks. I couldn’t use gelatin, however, because gelatin gelées ‘melt’ at around body temperature. Using gelatin would mean that the gelée would melt into a mess while the croissants were baking. I settled on agar, which has similar liquid-setting properties as gelatin and gellan gum. Agar is much easier to find than gellan gum and it is available at most health food stores. It also is not as thermoreversible as gelatin, and so it can withstand higher temperatures that the croissants would be exposed to while baking. The agar ended up being unable to keep the gelée together while the croissants baked, but it wasn’t really a problem because the croissant dough had formed a nice seal around the gelée during proofing (after I had pressed a couple of gaps closed). This makes me think that gelatin might work as well in these (although I haven’t tried it – if you do, I would love to hear about it). I later glazed the baked croissants with a really simple rose-scented icing to give the croissants a stronger rose profile. 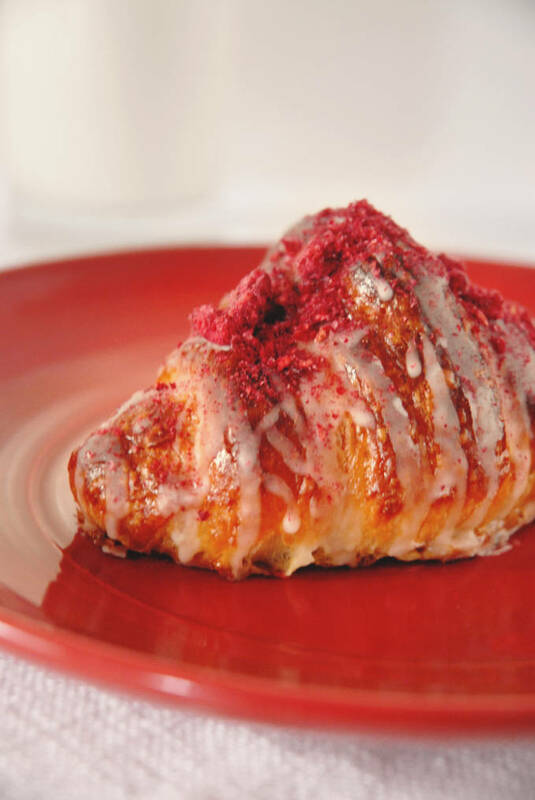 I also crushed some freeze dried raspberries on top to help give the outer layer of the croissant a perfect crunch that complimented the delicate, buttery, and raspberry-y center. The great thing about making croissants is that even if you don’t make them absolutely perfectly, they still taste amazing straight out of the oven. Ispahan croissants, inspired by Hermé, contain rose-scented almond paste, raspberry-lychee gelée, and crunchy raspberries. Post includes photo instructions. 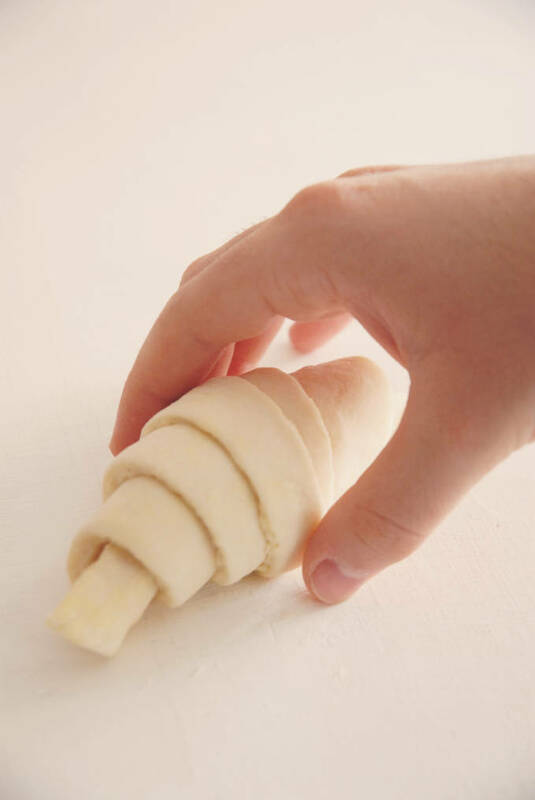 You can find my full croissant dough instructions here. Follow the steps up until cutting out the triangles, and then use the rest of these instructions to fill and decorate the croissants (you should work on both recipes together). Combine the raspberry puree, sugar, agar, and water in a small saucepan set over medium heat. Boil for five minutes. Pour the mixture into the pan and sprinkle the diced lychees on top. Refrigerate until set (about an hour) and then cut out strips approximately 1.5cm (0.5 inches) wide and 7cm (3 inches) long. Chill gelée until ready to use. Process all ingredients in a food processor until lumpy and sticky (note that it should not reach the consistency of almond or peanut butter). Place the almond paste in the fridge to chill for a couple of hours, and then place it between two sheets of parchment paper. Roll out the almond paste until is it about 2mm thick (1/16 inches) by pressing the rolling pin on the top sheet of parchment paper. Cut out triangles about 12cm (4.5 inches) high and 2¾ inches (7cm) at the base. Chill until ready to use. Place a triangle of rose-scented almond paste in the triangle of croissant dough. 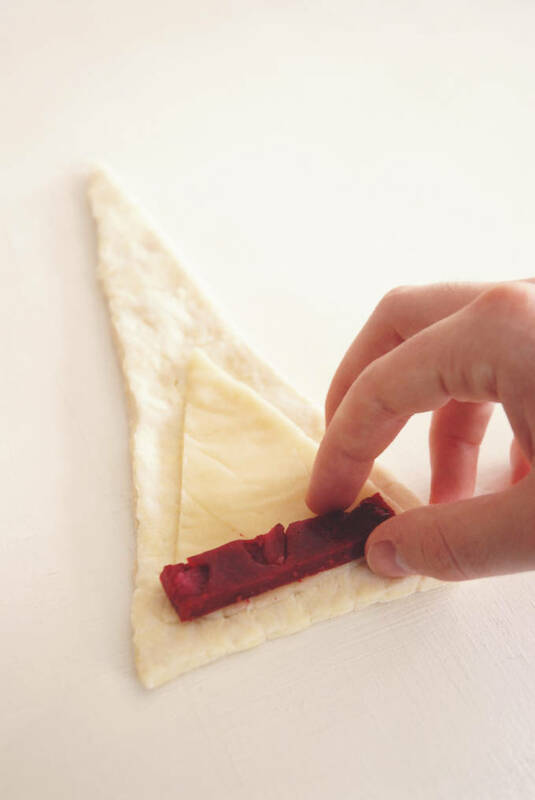 Place a piece of gelée at the bottom of the triangle, cutting some off if necessary so that it will fit. Tightly roll up the croissant from the base, streching it as you do, so that there are three full rolls of croissantthat makes seven "steps". 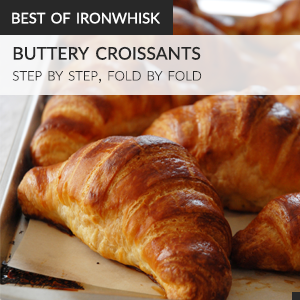 Place the croissants on a parchment paper lined baking tray about 5cm (2 inches) apart. If you see any of the gelée, lightly press together the dough to seal any gaps. Preheat your oven to 375°F (190°C). Lightly brush the croissants again with egg wash (double egg washing helps them develop a nice crispy exterior). Bake for about 15-25 minutes, or until golden brown. Stir together the icing sugar and water until the icing is thick and syrupy. 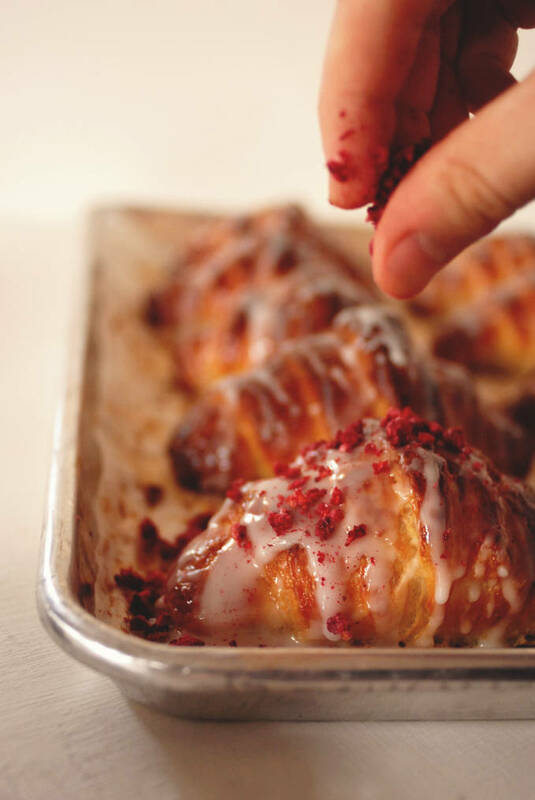 Wait for the croissants to cool slightly (about ten minutes) and then drizzle on the icing and top with the freeze dried raspberries, if using. I’ll take a dozen of these please! Lovely work! These look amazing!! I was in California back in May but never got to see San Fran. Would love to someday! So pretty!! And raspberry, rose, lychee is a stellar combination. I just happen to have freeze dried raspberries in my pantry and have been contemplating what I want to do with them. I love the way you used them. Well played! Wow so elegant, and they look mighty delicious as well! Congratulations , you now have completed your compulsory years of school. Much credit to You and your Parents –I think–yes definitely!!!. All this and the distraction of a fan club er web site and er comments. What next? do not allow us to impede your accomplishments in College if you consider food a “hobby” so be it —if you consider your blog an outlet so be it, — what is your passion?? follow that dream? Economics what? food economics??? the economics of food perhaps? Philosophy??? what kind of paycheck is that? Mathmatics?? Be the change you want to see in the world. Okay… you still have to pay rent… business, finance, start looking at the want ads now and what kind of background the employer seeks for a candidate in a field that “interests/tolerate….or start your own business now(birthday party cakes??) or work for a caterer you serve the fabulous food and observe how it managed I say managed to get to your tray…. Hey Ilan, these look great, I was wondering can you recommend any books on pastries that you have found are particularly well documented and interesting? Hi Leon, I don’t really have any great baking books. I heard Hidemi Sugino’s books are really good though. That’s an awesome video! What a lovely trip your brother took you on, I do hope you will share your experiences and photos. I love San Francisco and hope to return someday soon (I’ve been twice, once with work and once with my hubby). These croissants look fantastic and sound absolutely delicious. You were in SF! I hope you enjoyed your trip here. I really think you are going to be an amazing pastry chef (actually you are already!). Your passion and the details of your work is really inspiring and I enjoy reading your posts. These ispahan croissants look wonderful. Wow- these are so different. They look really good and you did a great job making/shaping the croissants! I have always failed at making croissants either they don’t proof enough or when they bake the oil seeps out and turns into fried croissants. Do you have any tips to prevent this and still have croissants? Yours look amazing. Sure Eva! Are you using the proof setting in your oven? That often is too hot and can cause the butter to melt during the proofing process, which is definitely not what you want. I sometimes proof mine up to four hours at room temperature. Also, be careful when folding the butter, and always make sure your dough is cold. Check out my croissant tutorial, it has a lot of helpful tips and tricks.